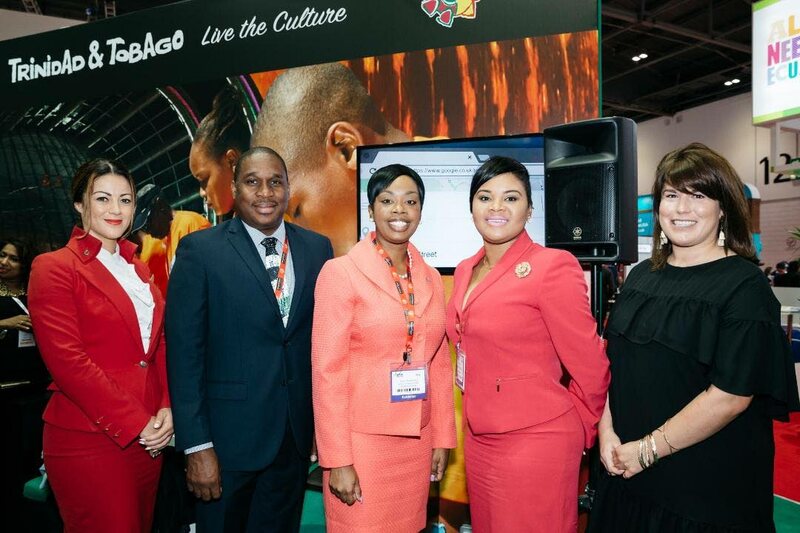 Tourism Minister Shamfa Cudjoe, second from right, and Tourism Secretary Nadine Stewart-Phillips, third from right, ose for a photo with, from left, a representative from Virgin Atlantic, Louis Lewis, Chief Executive Officer, Tobago Tourism Agency, and Lizzy Davis, Content Creator, Virgin Atlantic at the World Travel Market 2017 in London on Monday. Destination Trinidad and Tobago is now re-born, re-focused and ready to do business as Government refocuses its efforts on the development of the tourism sector. “We are re-developing all of our tourism offerings and getting ready to welcome the Brix Hotel which is part of the Marriott Autograph Collection, and in Tobago we are getting ready for Sandals,” she said. Stewart-Phillips said Tobago’s focus on cultural tourism was a result of the THA recently merging of the departments of culture with tourism and transportation. “The visitor spend from cultural and heritage travel is also more,” she said. Also at the press conference, Virgin Atlantic’s Content Creator, Lizzy Davis, announced the launch of “Let’s Map Tobago” which allows stakeholders as well as visitors to upload photos of events, places and people. The project is supported across all social channels and is powered by Google. Other activities announced at tourism fair were the Lime 365 Calendar of Events, the development of new tourism entities in Trinidad and Tobago to manage the tourism sector and efforts to secure increased and new airlift. The annual World Travel Market brings together some 5,000 destinations, technology and private sector companies to exhibit and network with over 51,000 travel professionals, key industry buyers, and international media, digital influencers, students and senior government officials. Reply to "Destination TT ready to do business"